We have a few temporary tattoo tips to get the most from your Tattumi order . We use Google image search – who knew?!? There are some pretty solid boards on Pinterest out there with good design ideas whether it’s Disney Princesses or Russian criminal gang tattoos that provide you with inspiration. If you are uploading designs, please ensure that your uploaded designs don’t have copyrights on them. Also don’t forget to check with your local criminal Russian criminal gang that you’re not transgressing. 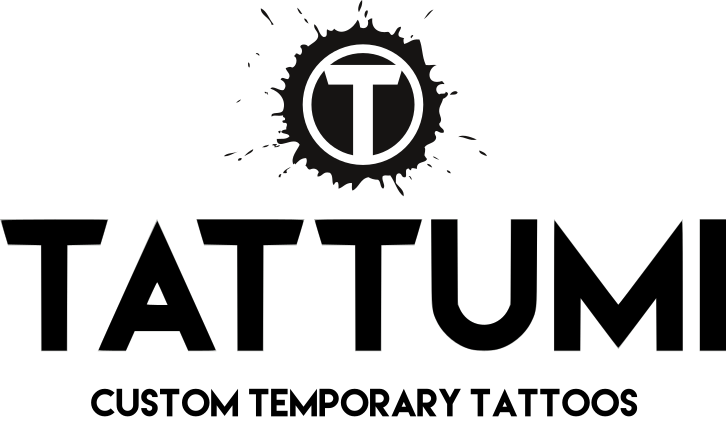 As per our terms, if you upload and order a custom design on Tattumi, you assume responsibility for ensuring there are no copyright infringements, or heavy handed retributions from offended criminal fraternities. If in doubt just draw a design on paper and photo/scan it! Don’t forget to follow Tattumi_UK on Instagram for ideas and examples of some of the tattoos we’ve produced. We love to share your work too… so please tag and share your work with us! – Apps like imadeface… can render pictures cartoons and good fun to mess about with. – The design canvass on our custom tattoo builder has some pretty cool features. Especially the text tools, where you can choose from a good section of fonts and colours and curve text around design to personalise it further. – Lines and borders. Bold line and solid borders generally work better on the tattoos although we intricate design work well. If the design is bounded by a border, it holds it look longer. You can leave notes when you make an order. We’ll also print and include spares and extras where we can and have material available to do so, keeping you in bonuses and back-ups. – Trim down your Tattoo close to the design. Over time the margins on your temporary tattoo transfer become visible. If the closer you trim to the design, the less obvious this is. – Rub the tattoo with a dry cloth to work out any air bubbles that may be trapped in there before removing the film and applying. – Avoid hairy patches of skin…and areas that get rubbed a lot. Your tattoo will look better and last longer. – On applying the tattoo the backing paper should simply slide away with one finger. There’s usually no need to peel these away. If it feels like part of the tattoo/design is catching and or not applying properly, just add more water to the back paper so it is soaked through. – Apply a few hours before you show them off. Our temporary tattoos can be shiny when first applied and typically look best after a few hours of wear. You can apply a bit of talcum powder to give a more matt look if that’s what you’re after. Above have FUN and happy tattooing!